Congratulations to M. Roberts who placed the winning bid of $1,000 for November's silent auction painting, "Outskirts of the Village" by Mikhail V. Akinshin, estimated at $3,000 to $4,000. As our December silent auction selection, we are thrilled to present one of the best works we've ever offered over the years and one perfect for the Holiday Season, "Senezh" by Ilya L. Katz. Estimated at $6,000 to $7,000 and with a current bid of just $1,750. Works by Katz are often included in the major Russian art auctions in London, Moscow, Copenhagen and Helsinki. Ilya L. Katz is a renowned landscape painter, one of the original masters of Soviet art and a key representative of the Southern Russian School. He graduated from the renowned Repin Academy where he won several student honors. His talent was noticed early and he was tutored by the top professors. His work is included in the collections of numerous Russia's museums including the famed Tretyakov Gallery in Moscow. Finished in 1948, "Senezh" is a landscape gem. The scene is of a dacha near Senezh Lake, about 60 kilometers outside Moscow. 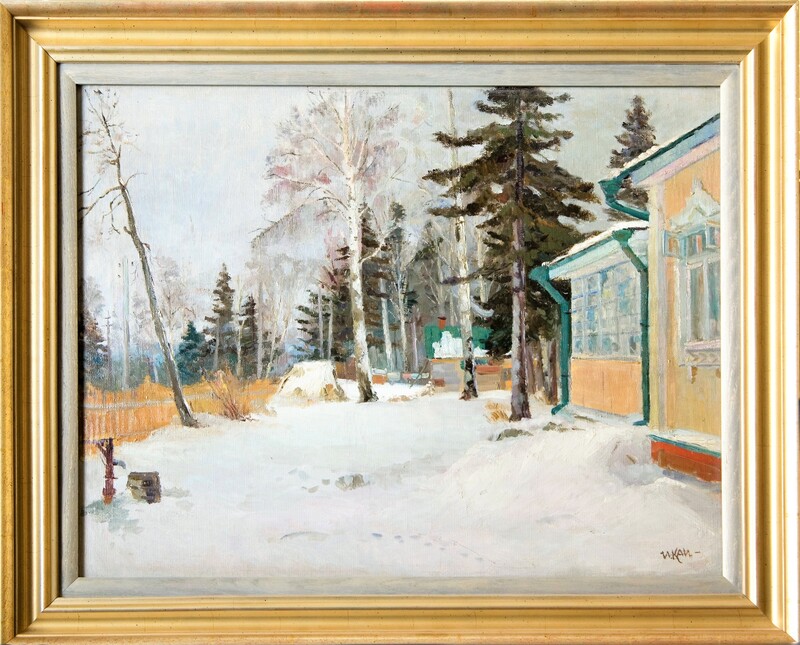 The painting is especially interesting as the artist began working on it in 1945 upon his demobilization from the Red Army and emotional reunion with his family at this Senezh Lake dacha after the long and devastating WWII. We invite you to participate in this month's auction and thank everyone who placed bids last month. This is an exceptional opportunity to add a beautiful work by a highly acclaimed artist to your collection or perhaps for that perfect holiday gift. Estimated at $6,000 to $7,000, the current high bid is just $1,750! The next bid is $2,000, followed by minimum bidding increments of $250. Remember, there is no reserve, at the end of the auction the high bid wins! Bids will be taken via telephone, or e-mail until 7:00 pm MST, Friday December 29th. Follow all the bidding updates on the Gallery's website. Ilya L. Katz is a representative of the older generation of masters of Soviet art. He was born and grew up in Odessa Ukraine. Katz began his art training at the Odessa Art Institute in 1929 where his first teachers were the masters of Ukrainian art AF Gaush and TB Fraerman. Katz then transfered to the famed Leningrad Academy of Art named after I. E. Repin, where he studied under the guidance of professors A.M. Tkachev, T.B. Fraerman, and A.F. Gaush. His diploma work was carried out under the instruction of Yuli R. Bershadski. Creatively I. Katz is a synthesis of classical Russian art and French "Cezannistov." 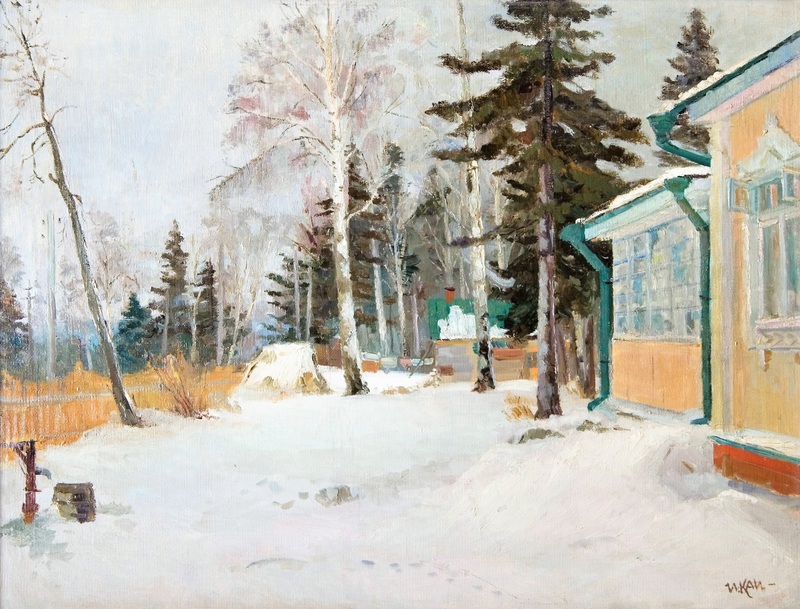 In the late 1930"s Katz was appointed chief artist of the Museum-reserve "Mikhailovskoe" and he began exhibiting in 1938. He took part in the "All Union Exhibition of Young Artists Dedicated to the Twentieth Anniversary of the VLKSM" in Moscow in 1939. The war for Katz began in 1939, when he was drafted into the Red Army and participated in the liberation of Western Belorussia. Later he fought in the Great Patriotic War as an anti-tank gun commander during Battle of Stalingrad, the demobilization in 1945 and the return to Moscow. Katz received several medals for his service. After the war, Katz became a member of the Artist's Union (1948). He spent time traveling around the Soviet Union, and these trips were the inspiration for his specialization in seascapes and landscapes. Katz was also a graphic artist, and produced several series of monotypes in the 1960's and participated in the decoration of pavilions at the great All-Union Agricultural Exhibitions of 1938 and 1953. One of his most important exhibits in which he participated was "Soviet Russia" in Moscow in 1960. Additionally, Katz's showed his genius in one-man shows in 1972 and 1987 in Moscow. Works of the artist are in the Tretyakov Gallery Moscow, the Museum of contemporary history of Russia Moscow, Central Museum of the Revolution Moscow, the Radyshev Art Museum Saratov, the Vorkuta Local History Museum and in many regional museums and private collections. Katz died in 1991. -Painter. 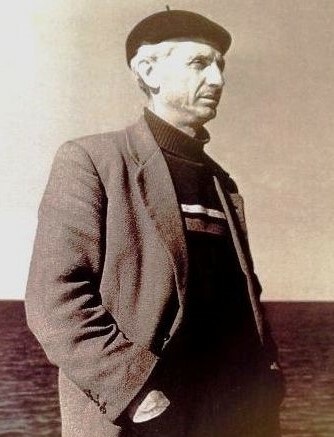 Member of the Union of artists of the USSR. -The main representative of the southern Russian art school. -Born in 1908 in Odessa. -He studied at the Odessa art Institute under A. F. Gausa, T. B. Fraerman. -Completed a thesis «In fishing collective farm» under the direction of Yu R. Bershad. -Participated in the design of the pavilions «Turkmen SSR», «fisheries of the Volga region» and others on VSHV (1938?1953). -Personal exhibition I. L. Katz took place in 1937 and 1987 in Moscow, in 1972 in Dubna. -Painted mostly seascapes. The sea was the main theme of the artist. -Created a series of works «By Pushkin places». -Is continually displayed at Moscow exhibitions, exhibitions of landscape painters or Union art exhibitions. -Works of the artist are in the Tretyakov gallery, the Museum of contemporary history of Russia, in many regional museums and private collections.